Minty Fresh is a beautiful mint green polish with subtle green and silver shimmer. I think the shimmer adds a little something extra to this one and makes it a little more unique. It's a perfect spring or summer polish that would also work well for a pedicure. The formula was a bit thick, so make sure to use thin coats. Even with using thin coats, only 2 coats were needed for full coverage. 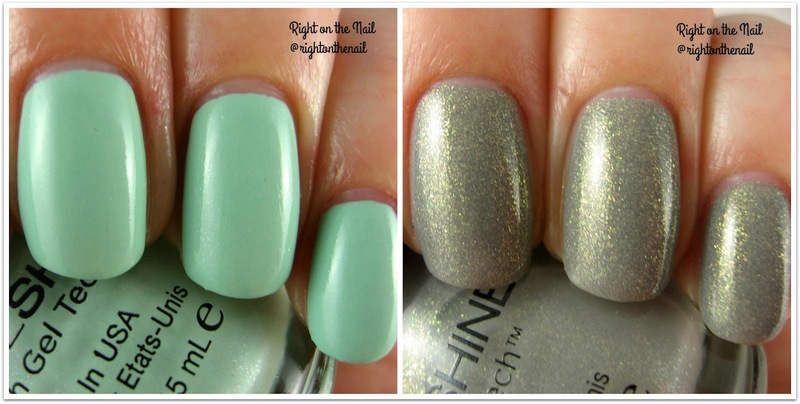 I don't keep my love for grey polishes a secret, and when you add gold flakie shimmer, you can bet I'll buy it! I can't believe I'm saying this, but I think they could have gone with a little less shimmer. I KNOW! Blasphemy! Oh, and I apologize for only having 2 pictures, but the hand pose I use first didn't turn out. Of course I found this out after I took the polish off. It applied like a dream in just 2 coats. I definitely recommend this one! These retail for $2.98 at Walmart and other drugstores. For the price, I say go for it, but not necessarily because it has the Kylie sticker on it. Also check out SinfulColors on Twitter, Instagram and Facebook.